From the time that Kim Guerrette Michaud of Mapleton was growing up in Presque Isle, her family ensured that community involvement was an important part of her everyday life. “My parents owned their own business and they felt that, since the community supported them and allowed them to have a successful business, they should give back,” Michaud said. Her parents, Dodie and Philip Beals, owned and operated Golden Crest Springs, a bottled spring water company, and her mother also worked for the Presque Isle Recreation and Parks department for 35 years. Some of Michaud’s fondest childhood memories are of participating in local swimming, softball, tennis and arts and crafts lessons. During her more than 30 years in the business world — first in banking and now in the insurance industry — and time spent raising four children, Michaud has found time to help her community through activities that she loves. She is the chair of the board of directors for Wintergreen Arts Center, a pageant coach and judge, has cooked for numerous fundraisers and bake sales, provides photography for organizations during local golf tournaments and — along with her husband, Carl Michaud — coaches the Special Olympics soccer team, the Aroostook Grasshoppers. For the past five years Michaud has been involved with Wintergreen. 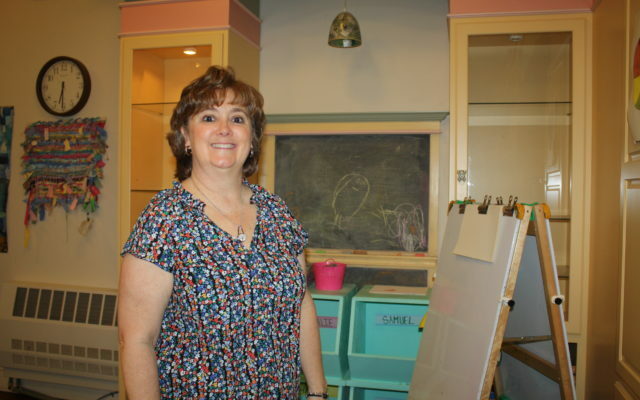 She has most enjoyed seeing the nonprofit organization expand their outreach to local children and adults through special events such as Ladies Art Night and Wintergreen Express, a preschool program and First Friday Downtown Art Walk exhibitions. She believes that the center provides great artistic opportunities for people of all ages. Michaud has also used her cooking skills to provide special memories for residents of the Sister Mary O’Donnell Emergency Homeless Shelter in Presque Isle. As part of the shelter’s Meal Train program, she cooks meals for the residents every Easter and Thanksgiving and has often recruited family members and co-workers from MMG Insurance to help serve the meals. As a coach for the Aroostook Grasshoppers, Michaud has formed strong bonds with the players, all of whom regularly deal with challenges from developmental disabilities. She fondly recalls one girl who, during the team’s third season, was one of the most enthusiastic players. But when she was on the soccer field, she never moved. Though Michaud spent the first 14 years of her career working for a bank in the Portland area, she knew she wanted to return to Aroostook County to raise her children close to other family members. She is now grateful to be part of a company that has allowed her to grow professionally and work on group projects. She has formed great memories with co-workers, whether they’re taking part in community service projects or decorating their cubicles holiday style for their annual contest. But none of her work ethic and community spirit, she said, would have been possible without the support of her family and friends. “I think growing up in Aroostook County definitely shaped me as a person. There’s a safety net in knowing that people are always there to support you if you need help,” Michaud said.